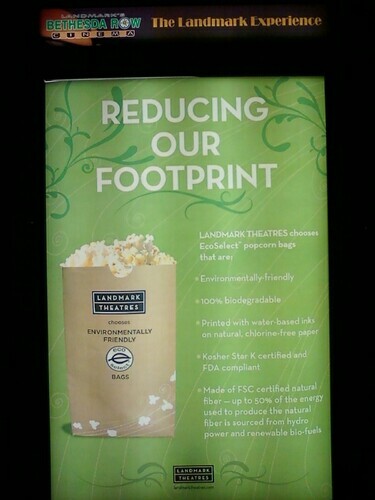 A recent trip to Landmark-owned Bethesda Row Cinemas revealed that the theater chain is reducing its carbon footprint by selling eco-friendly popcorn bags called EcoSelect. This is great news for moviegoers. In honor of Earth Day, Landmark Theatres is initiating the launch of the new EcoSelect popcorn bag in its 55 theatres across the country. EcoSelect popcorn bags are made of FSC (Forest Stewardship Council) certified natural fiber—up to 50% of the energy used to produce the natural fiber is sourced from hydro power and renewable bio-fuels. The bags are printed with water-based inks on natural, chlorine-free paper and are 100% biodegradable. “Our customer base not only loves independent film but are also environmentally conscious and this is one more way we feel we can connect with them in a positive way,” said Landmark Theatres’ CEO Ted Mundorff. “Landmark Theatres sells almost 2 million bags of popcorn every year. It’s important to make improvements where you can and this is just one step in an ongoing effort,” said Damien Farley, Landmark Theatres’ Director of Concessions.